The struggle for workplace health and safety is undoubtedly one of the most noble aspects of the labour movement. It is a struggle for human dignity, the refusal of workers to sacrifice their health and years of their lives in order to earn a living and support their families. It is also one of the most radical aspects of the labour movement because it challenges management prerogatives in an area that it has always jealously kept for itself: the organization of production. Quebec’s union movement has waged stubborn, sometimes heroic, struggles on this battlefield and has won significant victories, even if much remains to be done. All the more troubling, therefore, was the reception that Quebec’s union federations reserved the other week for a delegation from Asia, consisting of a representative of the Building and Wood Workers’ International and victims of asbestos. The immediate aim of the delegation was to ask the government and people of Quebec not to give financial support to the exploitation of a new vein at the Jeffrey asbestos mine, whose production would be exported to Asia. Neither the FTQ (Fédération des travailleuses et des travailleurs du Québec) nor the CSN (Centrale des syndicats nationaux) saw fit to respond to the request for a meeting. Only the CSD (Centrale des syndicats démocratiques) met the delegation, but in the presence of a lobbyist of the Chrysotile Institute. This institute is financed by the governments of Canada and Quebec and by the asbestos industry (presently bankrupt). Its mission is to promote the export of asbestos to developing countries – the wealthy industrialized countries have either banned its use or it is simply not used – and to cast doubt on the scientific consensus that there is no safe way to use this cancer-causing substance, which, therefore, should be banned. This position has been adopted to date by 53 countries, by the World Health Organization (WHO), the OIT, and by the International Trade-Union confederation, to which the FTQ, CSN and CSD belong. However, the President of the Chrysotile Institute is Clément Godbout whose CV includes: former president of the FTQ, and the Steelworkers/FTQ, the CSN Metallurgy Federation, and the CSD are members of the institute’s support group. The Chrysotile Institute does not deny that the substance causes cancer, but it maintains that it can be safely used under controlled conditions. 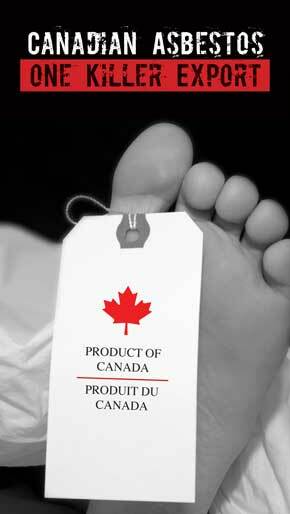 It insists that Quebec exporters demand assurances of such conditions from their clients. But the Quebec Minister of Economic Development – who did meet with the delegation – admitted that such assurances cover only the first 0.1 per cent of the life of the asbestos. The government and the industry thus wash their hands of the activities that follow, activities so dangerous that they are illegal in Quebec but very common in the developing world: cutting and breaking asbestos-cement building materials with a saw, without any protection; using pieces of broken asbestos-cement, without any protection; demolishing and renovating buildings containing asbestos, without any protection; living amidst the debris of asbestos-cement after a natural disaster, such as an earthquake, without any protection. “Listen to us,” replied Anup Srivasta of the Building and Wood Workers’ International. In 2006-07 the Quebec Workplace Health and Safety Commission, the National Institute of Public Health and the Ministry of Health and Social Services – the principle government health authorities – jointly conducted a study on the use of asbestos in Quebec industry. They visited 959 workplaces where asbestos was more likely to be used but found that only eight still used the material. And of these eight, not a single one used it in safe conditions. Asbestos is the foremost cause of work-related deaths in Quebec. Following the rapid decline of asbestos mining from the 1970s, the prevalence of illness related to the mineral shifted from miners to workers in construction, maintenance and renovation. According to a spokesperson of the CSST (Commission for Workplace Health and Safety), “employees in construction more at risk, since too often they do not know that they are working with asbestos.” Roger Valois, vice-president of the CSN, has criticized the government for refusing to tell if there is asbestos in public buildings and infrastructures. The CSN has been trying for some time to get the government to certify entrepreneurs who would specialize in removing asbestos, but so far without success. Could the situation possibly be different in countries where the majority of workers are hired by the day, are not informed of the dangers they incur, and have no say in their work conditions? Few among them have the possibility of obtaining diagnosis of a work-related sickness and even less of receiving compensation from the industry for themselves and their families. The workers, their families and their whole communities continue to live near asbestos dumps without any protection from this pollution. 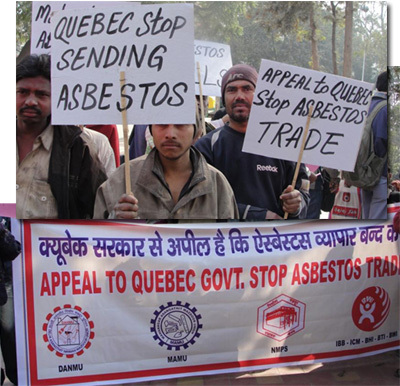 It is not surprising, therefore, that Quebec unions, including the construction unions and the CAW-Quebec region, insists on bans on asbestos in their collective agreements. What is surprising, however, is that we do not hear their voices in Quebec – the only province that produces and exports asbestos – among those who condemn the role of their governments in promoting asbestos in developing countries and in sabotaging the UN (Rotterdam) convention that would oblige exporters to inform importing countries of the risks and give them the right to refuse entry to the product if it considered its workers unable to use it in safe conditions. On the contrary, as noted, certain unions actively support these policies, while others maintain a shameful silence. Meanwhile, in Asia unions are mobilizing to demand a ban on asbestos. What perverted conception of working-class solidarity could explain this complicity with the policy of our governments and the asbestos industry? There is, of course, the issue of jobs in the asbestos industry. But even if we leave aside the moral dimension (the WHO estimated that 107,000 die annually across the world from asbestos), it is not as if the industry has a long future ahead of it. Just as the market in the wealthy countries dried up quickly from the 1970s, so too is the Asian market destined to shrink as people become aware of the harmfulness of asbestos. The new mine, if it opens, will create only 240 jobs at $14-16 an hour, described by the local union leader as “starvation wages.” And to get even that, the union had to sign a long-term collective agreement. The communities of Asbestos and Thetford Mines deserve our solidarity. But can the accumulated defeats and the policy of “social partnership” of the union federations have so shrunk our horizons that we see ourselves today forced to defend – actively or by our silence – a corporatist position that makes us in solidarity with the bosses and their governments in a colonial and – let’s call things by their real name – deeply criminal enterprise? Have we so lost confidence in our own forces that we don’t believe it possible to mobilize ourselves to demand transitional measures for these communities and the creation by the state of decent jobs for their citizens?